Hailed as the “plant of immortality,” aloe vera is something we can’t get enough of. Chock-full of minerals, vitamins, and amino acids, aloe vera, is now an essential element of alternative medicine and cosmetology. Since growing succulents is the latest trend, why not grow your aloe vera plant and reap its health benefits, too? Whether using aloe vera for skin troubles or beauty enhancement, most of us use only a part of the leaf and end up throwing away the rest, which is such a waste of such a valuable resource. It’s also a waste of money if you purchased the leaves rather than cutting them off your own plant. Cutting an aloe vera leaf and extracting the gel can be a messy affair. So, you might want to do several at one time, which brings us to the need for storing aloe vera properly to avoid spoilage. 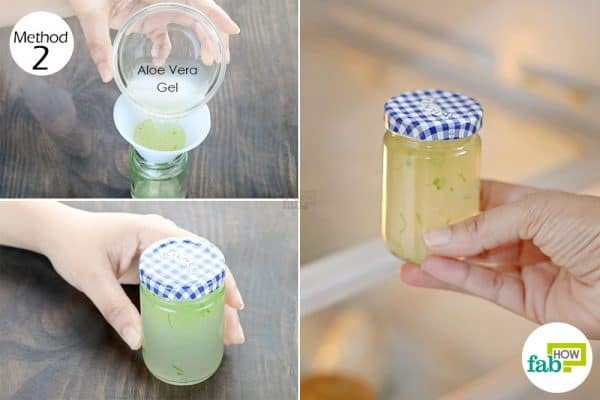 We tried some of the popular hacks found on the Internet and bring you the four ways to store aloe vera the right way. The easiest and perhaps the best way to store aloe vera is by storing the entire leaf. Since oxidation of the gel leads to faster spoilage, storing the whole leaf will keep the gel safe from exposure to air. Cut out a large sheet of plastic wrap. 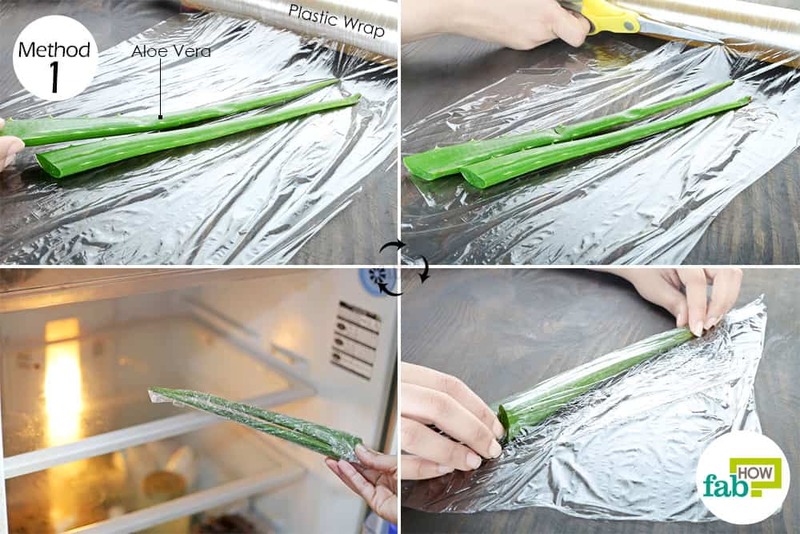 Wrap the aloe vera leaves in the plastic wrap and seal both ends. Store the sealed leaves in your refrigerator until needed. Refrigerating the leaves will keep the aloe vera gel good for 20 to 25 days. 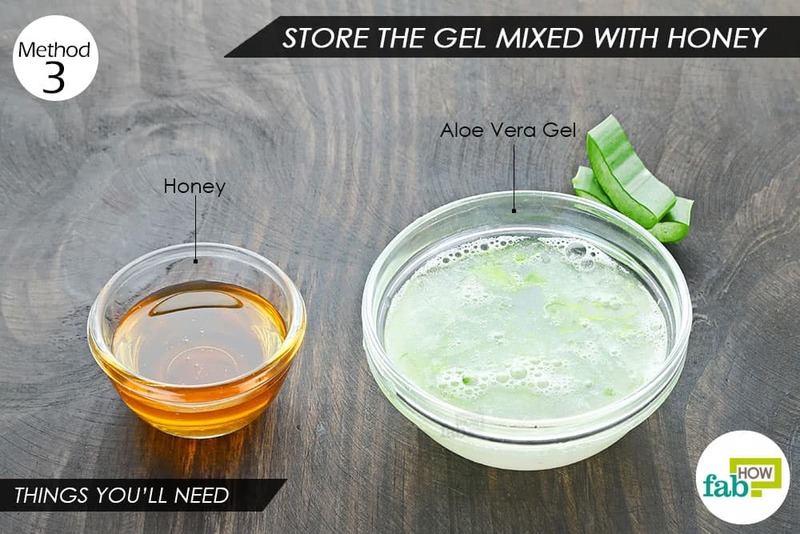 Since peeling and extracting the gel from an aloe vera leaf can be cumbersome, you may want to extract the gel in advance and store it. This way you can have the gel at your disposal, whether it is to treat sunburn or condition your hair. 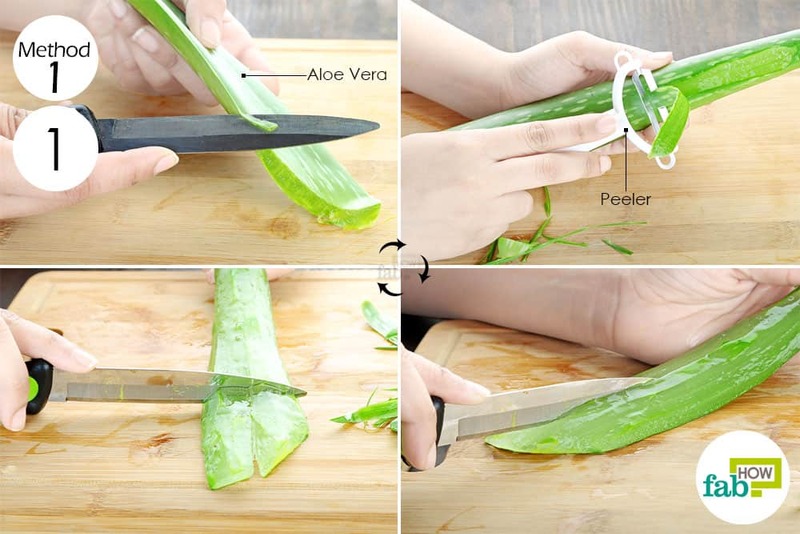 Extract the aloe vera gel from the leaf or leaves. 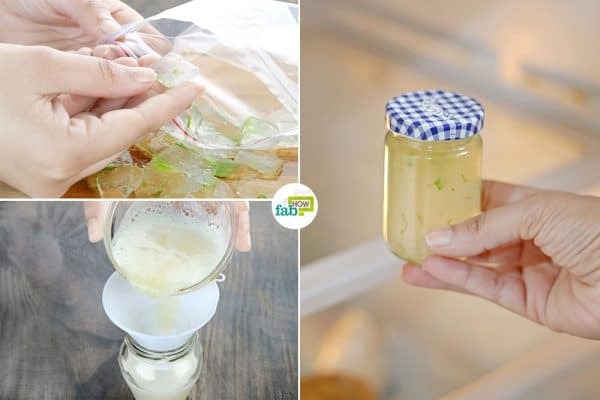 If you are clueless about how to go about it, you can learn the right way to extract fresh aloe vera gel. Use a funnel to pour the gel into an airtight jar and screw on the lid tightly. Store the jar in your refrigerator. Aloe vera gel will stay good for 6 to 7 days when kept refrigerated at all times. 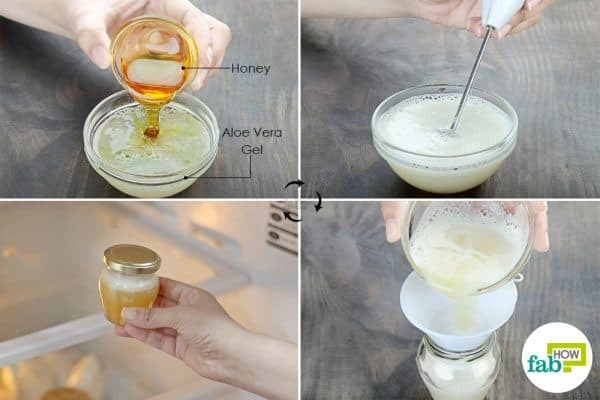 Another way to store aloe vera gel is by mixing in some honey. Since honey contains sugar and produces hydrogen peroxide, it works as a bactericide to extend the shelf life of the gel. You can consume the blend as a healthy drink first thing in the morning or use it in face masks. Add 1 tablespoon of honey for every ¼ cup of aloe vera gel. Transfer the blend to an airtight jar. Secure the lid tightly and refrigerate it until needed. Aloe vera gel mixed with honey will stay good for 10 to 15 days in the refrigerator. Freezing anything fresh can extend its shelf life by months. This is true for aloe vera gel. All you need to do is cut the thick gel into small cubes and freeze them in a ziplock baggie. Use a paring knife to slice off the serrated edges of the aloe vera leaf. Hold the leaf in your hand and begin peeling the skin off one side. Once done, peel the other side. Now, you should have a big chunk of aloe vera gel. Make a lengthwise slit in the middle of the chunk. Cut the big chunk crosswise to get smaller aloe vera cubes. 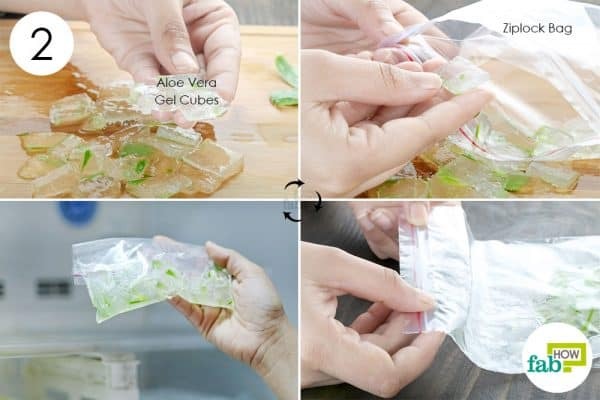 Put the aloe vera gel cubes in a ziplock baggie. Push out all the air from the baggie and seal it. Pop the baggie into your freezer. To use the gel, simply take out the amount of aloe vera cubes that you need and let them thaw overnight in the refrigerator. Frozen aloe vera gel will stay good for up to 6 months. To store aloe vera, you can also add vitamins E or C to extend the shelf life. Add 8 grams of crystalline vitamin C for every liter of aloe vera gel. If using vitamin E oil, add 6000 IU per liter of aloe vera gel. Blend either of them with the gel and freeze it for up to 8 months. If your aloe vera pulp is runny, you can also freeze it in an ice cube tray. You can also add a few drops of essential oils, such as rosemary, lemon or lavender, to extend the shelf life of fresh aloe vera gel. If you have leftover aloe vera and are wondering what to do with it, try making a healthy aloe vera tea or juice. This web page has been the most helpful of all the ones I’ve visited, or maybe I just understood it best because I read three other pages with the same information. Anyway, it still doesn’t answer my question. If you use portions of C, D, Lime AND Essential oils, could it work even better? Are they just different ways to skin a cat? Is there a recipe combination of all preservatives that might work best? I know one company uses extracts from all kinds of plants in combination to maximize the shelf life of aloe vera gel. I’ve annoyed one or two other forums already, though I’ll probably find out from our local distributors before any of them get answered. Apologies, but maybe it will help other people anyway. Maybe I’ll post my own findings? Thanks! Thank you for your query. As we have mentioned in the last section of our article (TIPS), you can add vitamin E or C, lemon or essential oils to increase the shelf life of aloe vera. However, while adding the preservative keep in mind for what use you are going to put that aloe in future. And adding all the preservatives at once will actually do more harm than good. Hi can you add any essential oils to the alo vera gel. So yes, you may add essential oils to aloe vera gel if you wish to use it for beauty purposes. 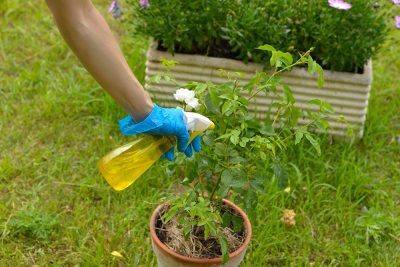 But it is best not to add it and store for a long period, as these oils lose their potent smell & properties over time. It is best to add it fresh every time or if you wish to add and store it in advance, store it for not more than a week. Thank you so much for the information , it has been most helpful as I wont be wasting my gel and leaves anymore . Please keep up the good work . Glad we were able to help! Stay tuned for more helpful DIYs and tips.